This story begins in the Intag Region of Northern Ecuador, an area on the western slopes of the Andes Mountain range. Intag, one of the world’s ten most bio-diverse ecosystem (1), is home to thousands of species of plants and animals, a rich rainforest and fertile farmland all because of the radical change in elevation. Here you can plant potatoes next to mangos, papaya trees aside bean stalks and have a field of pineapples down the hill from the corn; no wonder UNESCO has called this paradise a biodiversity “hot spot”. Those living in this region of Ecuador are mostly farmers, artisans and indigenous communities. With everyday comes the morning sun followed by an afternoon rain and a thick blanket of clouds that linger along the mountain tops. The locals wear knee high rain boots and a smile. A smile, A rain boot. I was brought to Intag because I was on a mission. A mission to build a fairtrade brand; to work and collaborate with a group of artisans. My search to find the team began in Peru, a neighbouring country famous for it’s artisan-made handicrafts and textiles, and where I happened to be living. It wasn’t long though before the Universe pointed me in the direction of Intag. I immediately researched the artisans online and was brought to a product I had never seen before: Bags woven from cactus. As I tried to contain my excitement, I looked further into the project and their process. The women were using an all natural plant-fiber harvested from a native cactus to weave a range of products. Not only that, but they used local plants and flowers to botanically dye each one -- That meant they were working with goods 100% made from the earth. At this point, I was amazed - this was exactly what I had been searching for. These were the women I was going to work with. I arrived in Ecuador and headed straight to Pucara, the small village where the women live in the Intag Region. On the bus, I passed local farms and every so often a farmer would hop on with a funny hat and sack of what I guessed were grains or vegetables. The bus’ brakes triggered every few seconds as we traveled down winding mountain hills. I looked out the window at the sheer drops and decided it was best to keep my eyes fixated on the beautiful views and low clouds. There I was in the middle of remotest Ecuador, really doing it: living out my dream. There was an American farmer in the region who helped me plan my stay prior to the trip. He had arranged for me to stay in the home of the one of the weavers, Celia. Celia was one of 18 women in the region who formed “The Floras de Choco”, the artisan group I was on my way to visit. I indeed was entering the choco, Spanish slang for rainforest, because once I arrived, I was handed a pair of the famous rubber boots. Out of all the women I met on the trip, I connected with Celia the most. Every night we would stay up late at her wooden table with the tree trunk stools under the single fluorescent light. You had to be strategic where you sat so your shadow wouldn't block the view of your work. Celia had her head down, working away at her woven piece while I was writing notes or looking up another unknown Spanish word. We sat and talked getting to know one another asking each other questions. She would glance up at me but her hands wouldn't stop. In and out, in and out the thread went. She didn't need to look, Celia has been weaving for over 20 years; she was a pro, this was her thing. She told me about that one day she did just that.. she left. Celia likes being single. No one to answer to no one to stress out or argue with. She is free to live her life. She started making money through weaving - selling her products to tourists or Spanish students, groups and at the local fairs. This skill gave her the confidence to walk away. She could support herself, her children, and didn't have to find the courage to ask anyone for money anymore. She had it - all by herself. Sadly, this was the same story for a number of the women in the group. Recently Celia’s ex came back for her. He showed up unannounced one day and told her he wanted to live with her in her house, said he missed her. I'm not sure how you say screw you in Spanish but I imagine that's how it went based on her words - Celia doesn't need him. She has her two hands. Her cow, her chicken, her children and a home she watches over. "I live in peace" she told me "that's all I want and weaving gives me the ability to do just that." I spent the next couple of weeks getting acquainted with the area, it’s history, the artisans and their amazing ancient art form. I learned that the use of this cactus fiber, known as cabuya, dates back to the 17th century and is known as one of the world’s first natural fibers used for commercial purposes. For thousands of years, inhabitants of Intag have been using cabuya to weave an array of products ranging from carrying sacks, ropes, shoes, mattresses, to baskets and bags. This plant fiber is made from the penca plant, similar to that of an agave cactus. The plant towers over any human; it’s leaves are strong and thick, explaining why the durable fiber is perfect for processing. It was simply amazing to me that this skill has been passed down from generation to generation over thousands of years and now, I had the chance to experience it first hand. I was eager to learn how they did it. What was the process like? What plants did they use? Was I going to learn how to weave and better yet, gain the women's trust to work with them? Let’s start with the process. Day after day I sat with Celia watching her weave away. This was the easy part, but how in the world did that bag come from a cactus? The women had explained it to me, but given my sub-par Spanish, it was better they show me. We put on our boots and took a walk down the only road in town. This is when I first began to comprehend why weaving was considered an art. After hoping a few fences with Celia, we ended up in a field that overlooked an open mountain valley and was home to a couple of cows and plenty of penca. I finally got to see the cactus up close. Using a machete, Celia chopped off one of the leaves and cut it open to show the cabuya. It was a white, string-like fiber. The fibre, the berry stain. Celia explained that this part was normally a man’s job and a group down the street had a machine to easily access the cabuya. When the women received the cabuya--in its raw state, sticky and tangled, with the consistency of wet horse hair--they had to wash, dry, and finally straighten the fiber with a large comb so it could be used. On our walk back to the house, Celia and I used a long stick to forage some red berries hanging from a tree. Just accessing the tree was a process in itself, but a fun one. We picked off the berries one by one dropping them into a bag and went home to start the fire. The women have an array of all-natural colors solely made from handpicked, native plants of Intag. The women seek out the plants, create the dye blends, and cook the cabuya fiber over fire in one of their homes. The women and I agreed that this was the best part of the process. The plant-seeking and fire-dying is generally done as a group. We all stood around the fire ohh-ing and ahh-ing over the brilliant yellows, deep purples and what happened when you put the cabuya in one color and then another: quite simply, magic. Once the colors have been added, the women lay out the fiber to soak up the sun and dry out one last time. The drying stage takes longer than you’d think given all the rain in the region. For example, with the help of her family, Celia would lay out the entire spool of yarn on the black asphalt and let it sit there for hours. If the rain came, they’d have to wait until the next day to do the same process all over again. The women collect the dried fiber and neatly roll it into a ball so it can easily be worked with during the creation stage. And now for the final step - Weaving the bag. The women use a crochet hook to weave slip-knot loops row by row. Working from memorized patterns and designs, each bag takes at least half a day of careful concentration and creativity to create; larger bags can take up to 3 days to finish. The women's’ working hours depend on their daily schedules. One of the women, Maria, generally woke up around 4am to begin preparing breakfast for her family. She would send the kids off to school, complete the household chores and begin preparing lunch. In between, in what could be considered her free time, she could weave. I spent most of my days interacting with Celia and her family--helping out around the farm, planning out the project, practicing Spanish and when I could, working online. The only place I could find wifi was at the house of the American farmer, Peter. During my daily visits, he filled me in on the history of Intag and the many problems it’s currently facing. From our long chats regarding these issues, I realised that my visit to work with the artisans was about to go way deeper than solely fulfilling a creative dream. Copper mining first came to Ecuador in the late 1990s. The beautiful mountains I stood on are also home to rich minerals, heavily sought after by foreign mining companies. Peter explained that for years these companies have been exploiting the surrounding land against the locals’ wishes and country’s laws. At times, their efforts became manipulative and violent resulting in many uprises, protests and illegal actions. The mining means many things for this region and its inhabitants: Deforestation, water contamination, endangered species and the manipulation of locals just to name a few. What’s even worse is that most of these companies are using a method known as open pit mining. A type of mining which begins at the grounds surface and works its way down, layer by layer, into the earth. This means the pit is constantly growing in all directions. This not only destroys the precious land, tapping into the water supply and exposing harsh chemicals into the air, but forces communities out of their homes and eliminates their food supply and means of income. These local towns, who once rejected the mining, were tempted and rewarded “special” assets--communities buildings, homes or even money--to sign off on the project. Since their land was taken unwillingly, families had no other option but to comply with the companies. Most men became miners and the women run services like laundry or food for the company workers. The close relationship the Intag community holds with the land was something I witnessed first hand. It was extremely upsetting to learn what could be at stake for the Floras de Choco, the group I had spent the month building relations with. I conducted an interview asking the women about the mining and what it means to them. Each of the ladies expressed their deep concerns that the companies were going to move into their community next. When I asked Maria what she dreamed of for her future, she could only refer to the mining and the fate of her children. Tears formed in her eyes. The interview did bring up some other points worth noting; like how weaving, along with other sustainable development initiatives, have been introduced and furthered upon to offer alternative economies to the region. For example, Peter has introduced many eco-tourism projects in Intag that directly benefit the community: A Spanish school, homestay program and a permaculture farm. Peter also hires locals to run and manage a nursery project. The project plants trees paid for by companies looking to offset their carbon footprint. Grassroot groups and companies are also working with the communities of Intag to offer ethical, environmentally-conscious jobs. An Intag coffee brand has created a 400 member fair-trade, organic cooperative for local farmers to grow, collect and distribute Intag coffee all over the world. Others are partnering with women groups to create artisanal soaps and shampoos, as well as clothes made from alpaca. When I arrived in Ecuador, I knew that illegal mining was present, but I had no idea what that meant for the community members or how I could get involved. I was naive and simply thought I would be joining these women for a weaving project. Little did I know that collaborating with these women to create a fair trade brand meant that my efforts would contribute to the region’s growing sustainable economy that’s competing against the country’s mining industry. By working directly with the “Floras de Choco”, I am introducing them to new bag designs while providing them with a reliable income. I’ve worked with them to set mutually agreed on, fairtrade prices to ensure they will benefit from the partnership. This ongoing dialogue guarantees a sustainable, living wage so they can cover expenses for themselves and their families, while avoiding the trap of the mining industry. When you or I purchase from these women we are keeping an ancient art form alive -- A skill that only a handful of people in the world still practice. We are bringing awareness to all-natural fibers and sustainable fashion methods. We are empowering these artists, these women and this community so they can continue to practice their freedoms and live in peace. Just eight months earlier, I was living in my own little cabana on the coastline of Peru, surfing everyday, eating fresh food, with friends and work, living a “perfect” life, yet something inside me was missing. I didn't have a plan for the year ahead. There was nothing pushing me, nothing inspiring me. Life was easy and simply that made me feel uneasy. I decided to pursue my passion, resulting in my mission to meet & collaborate with artisans, which would eventually take me to Ecuador. 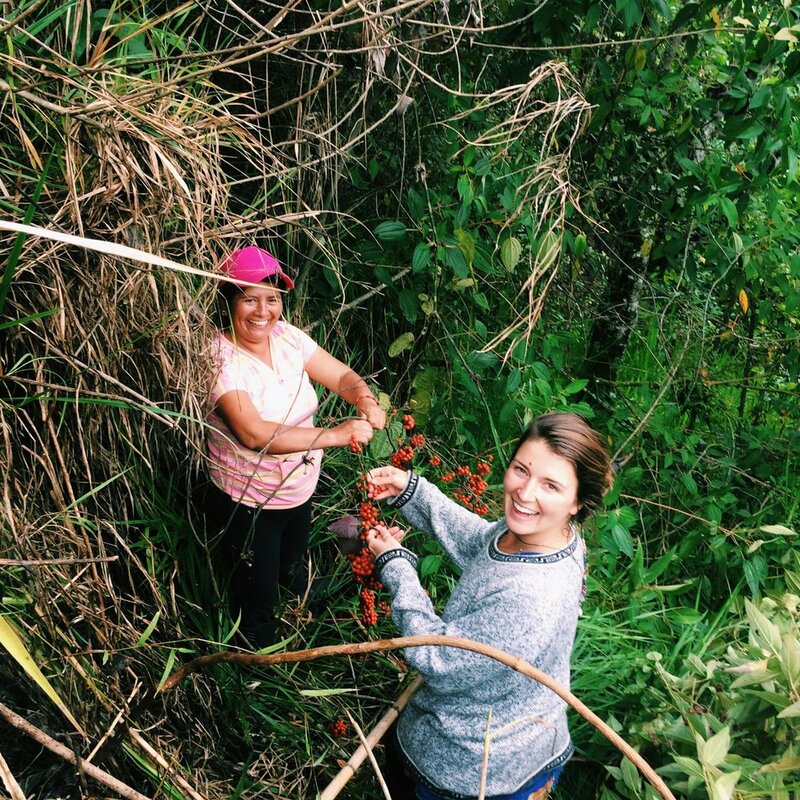 Ecuador - a country where I met 18 hardworking, talented women, saw their craft and heard their stories; a country where I witnessed what a small group of passionate individuals could do to create positive change in society. Ecuador - a country that taught me that if you work towards something with all your heart and all the goodwill in the world, the universe will deliver you that dream and throw in some extra lessons along the way. Before you book your next trip, take a minute to research the local problems that exist in the area. Search for volunteer opportunities and find ways to get involved that offer direct help to the local communities you’re visiting. While you’re out shopping, either in a new place or at home, look for products that are made locally, ethically and support fair trade. We can all make a difference by choosing to use our purchasing power. If you’re curious about how you can learn more and fight back against the illegal mining happening in Ecuador, please visit the DECOIN website that offers great information, volunteering opportunities and a donation page. The Under Rich Earth trailer is a short, yet powerful video that shows the realities of what’s happening in the Intag area. Feel free to watch and share. I thank you for taking the time to accompany me on my journey while working with the “Floras de Choco”. You can find us on Instagram at @madebyminga - Follow along as our story unfolds and drop a comment to let us know you found through GT. A big shout out to the gap year program, Carpe Diem, for putting me in touch with the Floras de Choco and Julian for providing me with such great photos and information.